I defrosted a Sockeye Salmon that had been in the freezer… then I marinated it in some Rice Vinegar, Soy Sauce, with Cinnamon and Ginger, and a healthy portion of Sea Salt for about three hours. I stoked the fire, added a few charcoal briquets, and a heathy helping of hickory chips, and let it start smoking. 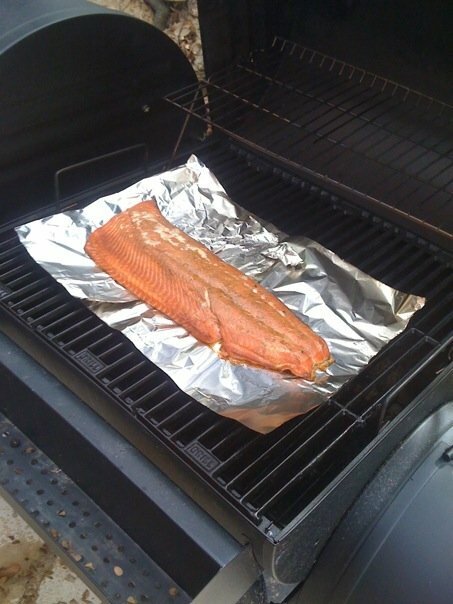 I put the Salmon on the grill around 4:00. The temp was 120°F and the smoke was flowing. I checked it every 10 minutes or so until about 4:40. Grayson woke up right after I took that photo, and was crying, so I got distracted for a few minutes… I took it off the grill at 5:00. I should have grabbed it at 4:45 or so, I think. I put it in the oven to cool a little while I finished up the peas and corn. We sat down to eat around 5:30, and while the Salmon tasted like Smoked Salmon, it was just a tad dry. Not bad, mind you, but definitely should have come off the grill a little earlier. Did a much better job of keeping the fire under control this time, and got the perfect amount of smoke. This morning, I got it in my head that I wanted to smoke something on the grill (I installed the smoking part on the grill yesterday). So, I defrosted 10 Bratwursts we had sitting in the freezer. Things were looking good for the first 45 minutes or so, then I added some wood to the coals… and the fire got a little out of control. 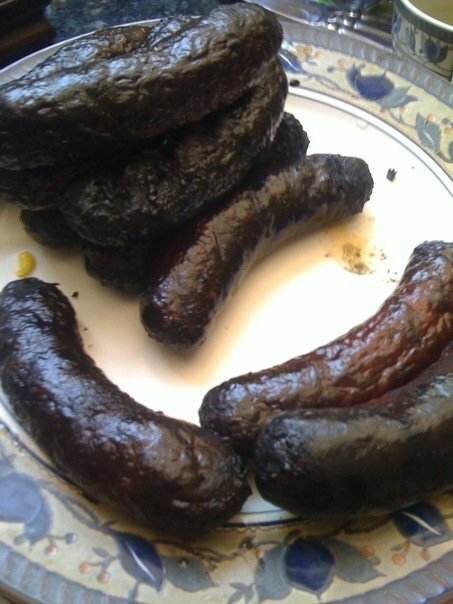 I went outside to check on things after about 20 minutes, and the grill was over 500 degrees… Needless to say the Brats were a little burnt.